Esther Eggertsen Peterson (December 9, 1906 – December 20, 1997) was a lifelong consumer and women's advocate. The daughter of Danish immigrants, Esther Eggertsen grew up in a Mormon family in Provo, Utah. She graduated from Brigham Young University in 1927 with a degree in physical education, and a master's from Teachers' College, Columbia University, in 1930. She held several teaching positions in the 1930s, including one at the innovative Bryn Mawr Summer School for Women Workers in Industry, which brought milliners, telephone operators and garment workers onto the campus. She moved to New York City where she married Oliver Peterson. In 1932, the two moved to Boston, where she taught at The Winsor School and volunteered at the YWCA. In 1938, Peterson became a paid organizer for the American Federation of Teachers and traveled around New England. In 1944, Peterson became the first lobbyist for the National Labor Relations Board in Washington, D.C. In 1948, the State Department offered Peterson’s husband a position as a diplomat in Sweden. 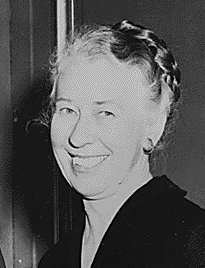 The family returned to Washington D.C., in 1957 and Peterson joined the Industrial Union Department of the AFL-CIO, becoming its first woman lobbyist. She was Assistant Secretary of Labor and Director of the United States Women's Bureau under President John F. Kennedy. In 1964, President Lyndon Johnson named Peterson to the newly created post of Special Assistant for Consumer Affairs. She would later serve as President Jimmy Carter's Director of the Office of Consumer Affairs. Peterson was also Vice President for Consumer Affairs at Giant Food Corporation, and president of the National Consumers League. She received the Presidential Medal of Freedom in 1981. Peterson was named a delegate of the United Nations as a UNESCO representative in 1993. Peterson died on December 20, 1997. 1 2 Molotsky, Irvin (22 December 1997). "Esther Peterson Dies at 91; Worked to Help Consumers". The New York Times. New York: NYTC. ISSN 0362-4331. Retrieved 7 October 2012. ↑ "Esther Peterson To Be Elevated". The Sumpter Daily Item. January 3, 1964. Retrieved February 17, 2012. Papers, 1884-1998 (inclusive), 1929-1998 (bulk). Schlesinger Library, Radcliffe Institute, Harvard University.